Mix the ingredients for the burgers together in a large bowl. With lightly floured hands, form a mixture into burger shapes. Heat the oil in a large non-stick frying pan and fry the burgers over a medium heat for 10 minutes, turning carefully halfway through cooking time. Serve on lightly toasted buns with lettuce and tartare sauce. Cook’s Tip You can buy salmon ready cooked from some stores. 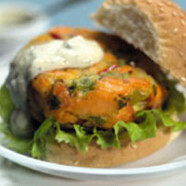 For outdoor eating, you could BBQ the salmon burgers.